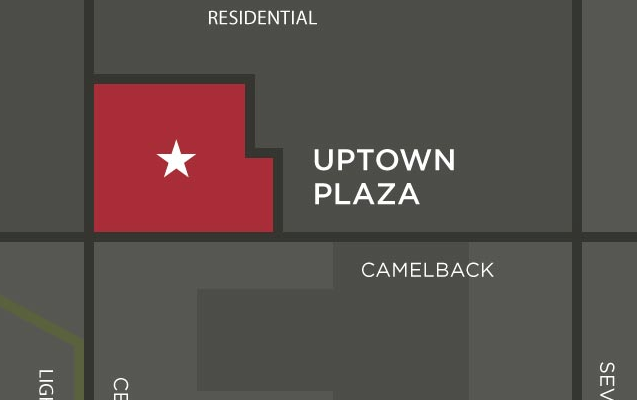 Uptown Plaza is a shopping center on the northeast corner of Camelback Road and Central Ave. It is undergoing major redevelopment. With its modern brick, masonry and steel midcentury modern construction, Uptown Plaza originally opened on August 25, 1955. It was constructed by Del Webb and was the first ‘suburban’ retail shopping center outside of downtown Phoenix. From the beginning, the unique mix of midcentury design details, along with a variety of shopping and dining options, made it a popular destination for Phoenicians. Uptown was home to everything from Jerand’s of Arizona fine fashions and Bostrom’s department store, to the national grocery chain, Piggly Wiggly (currently AJ’s Fine Foods). Over the years the center has suffered from a series of stucco ‘improvements’ and the once vibrant corner has experienced vacancies and under-use. Local developers, Vintage Partners, saw a unique opportunity to bring the center back to life. They approached the center’s owners to sell them on the concept of a comprehensive revitalization that would restore much of the midcentury modern elements and re-attract a mix of local, regional and national tenants to create a jewel destination. AJ’s Fine Foods is expanding. 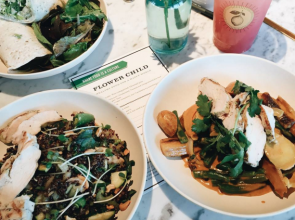 Muse, Flowerchild, Shake Shack, Lou Malnati’s, Creamistry, Local Nomad, R&R Surplus, Huss Brewing Company, Ellys, Nekter Juice Bar, West Elm, Sweatshop on Central and Prose have opened.